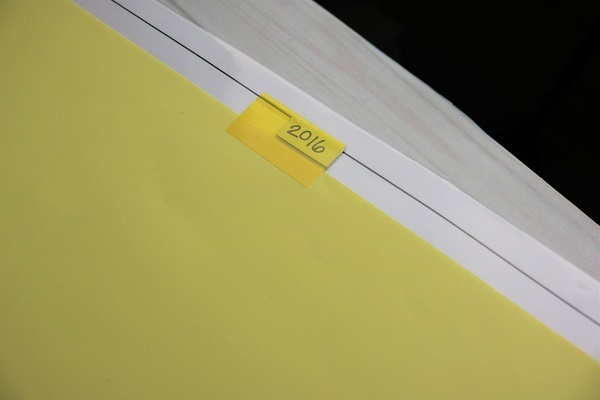 The following is a guest post about 3 paper organization systems for 2019 from regular contributor, Kristin at The Gold Project. Happy 2019! Two years ago, I shared a post about my Top 3 Organization Systems for 2017. Guess what? They are still my top 3 organization systems for 2019. So, I am definitely not going to talk about them again in today’s post. Make sure you check that post for all of the details about my monthly bill planner, receipt organization, and emergency binder. In today’s post, I am adding three more organization systems that I have implemented and that have stood the test of time. Sometimes, we can try an organization system and it just doesn’t work. But, those times when we find the right one, you just know it. 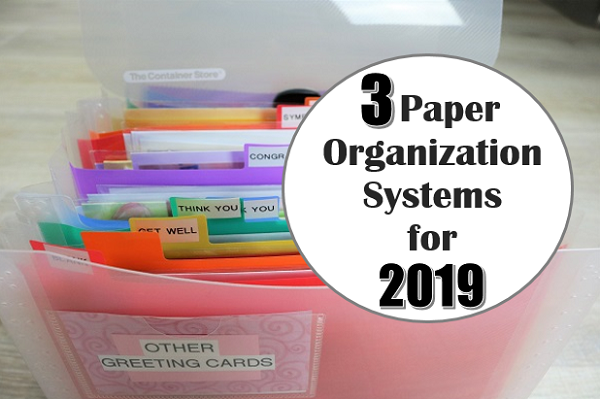 I hope you find these three paper organization systems helpful and can use them in your household. I tested out several different systems for papers until I purchased the Kvissle wall magazine rack from Ikea. It was a total game changer for me. I have used this incoming mail system for five years and it has worked perfectly. 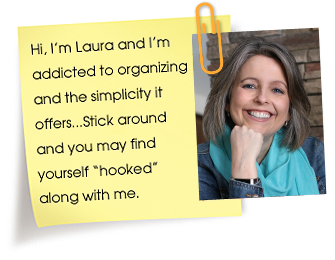 I was able to eliminate all of the paper piles that once accumulated in my office (see Laura’s similar system below). Tax time is right around the corner, which means it is time to get those documents ready to turn in to the IRS. 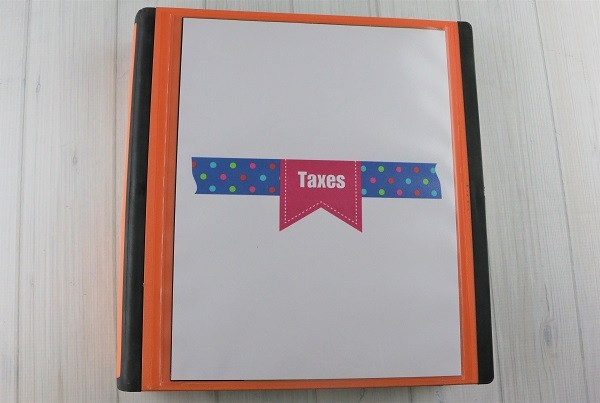 For me, it is pretty simple because I have created a dated Taxes Binder where everything from previous tax seasons gets stored. When I put this binder together, I knew it was going to work. I keep 8 years of tax documents in this one binder. When the new tax season arrives and I have new papers to add to the binder, I will shred the oldest forms. Then, I will add a new section with the current year on the tab. I highly recommend getting a tax system together for your household. Even if the binder system does not work, try something else. 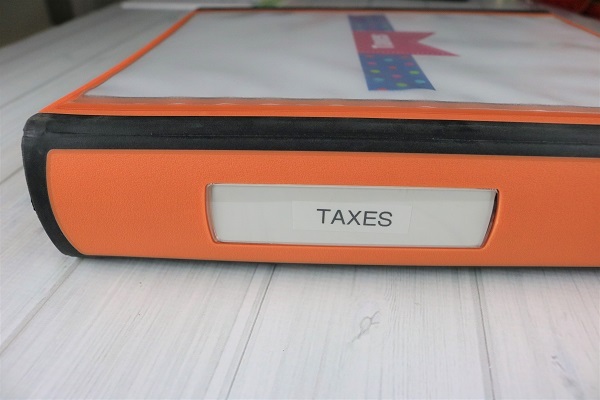 It will save you so much time and frustration during tax season. This may not be the first thing that pops into your head when you think of top paper organization systems, but it is one that I created several years ago and has never been changed. 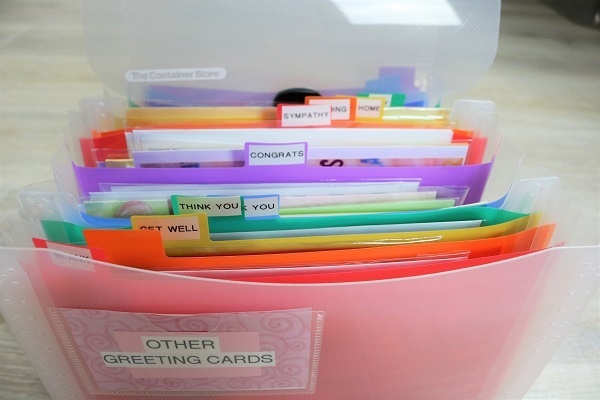 When I say greeting cards, I am talking about new greeting cards that have never been given to a recipient. I will admit, I am a person who almost refuses to purchase a greeting card in a store. Why? Because I feel they cost way too much, unless we are talking about some dollar stores. Some of the detailed cards cost over $5.00 for a single card. You can get a meal at some restaurants for that price. 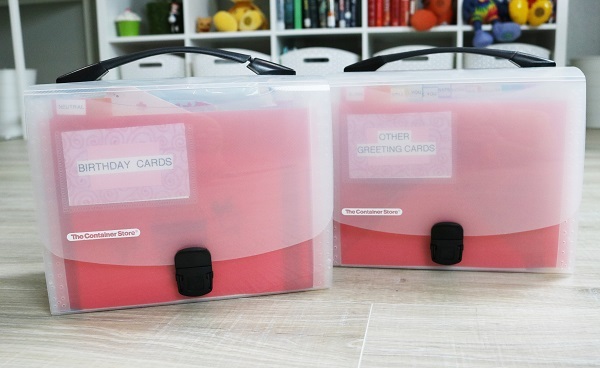 And, let’s be honest, a lot of greeting cards are not kept by the recipient. Instead, I like to purchase bulk cards from places like Amazon. You can get beautiful cards for a fraction of the price. Then, I sort and store them until I need them. The labels have worked perfectly. I haven’t had to change any of them. 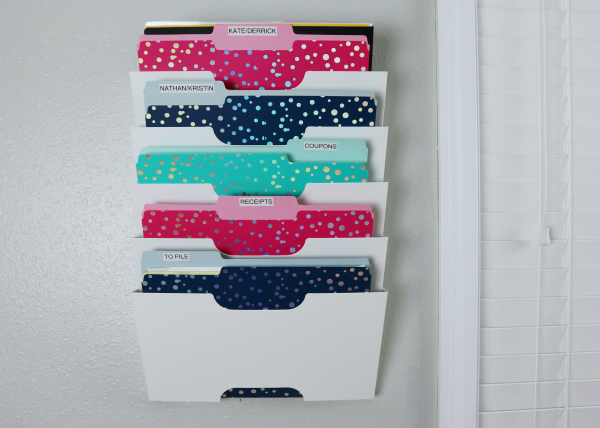 What paper organization systems are working great in your household? I don’t send many greeting cards, so I do feel spending a little more on them is ok. I buy them at craft fairs, usually a photo or original art work print. Art postcards can also work well as a card and I know I use them as bookmarkers, so I will pick up one if it appeals at Art Museums or craft fairs. 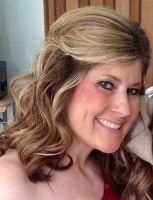 Just adding my .02.